OT: I am currently on a Hilton status match (Diamond) and need to complete 8 stays before 22 April. I am trying to maximise existing bookings to help me on my way (3 night stay in London, 5 night stay in Doha). Is it possible that I could book the alternate nights, and my wife booking the nights “in between”? When I get to the hotels, I was hoping to ask if we could keep the same room and not have to check out (though I would lose breakfast and exec lounge access as my wife is only Silver). Would that work? Anyone share similar experiences or tricks? Thanks in advance! You will need to check out – not physically, but you will need to go to reception every day, close off the bill from the previous night, get a receipt and then check in your wife for the next day. This needs ‘buy in’ by the hotel obviously, but will work fine if you do it – it will be easier if you are not upgraded as there is no issue then with keeping the room for those days when your wife is officially the guest. I’ve done this before with my partner during the lucrative avios offer last summer. It worked as Rob outlined, however, I forewarned the hotel and they were not bothered at all. We got to keep the same room, just stopped by the desk for new keys each day. Thank God it’s you. I was most confused! We were in Florida last summer for 2 weeks, my husband and I alternated nights a few times in an Embassy Suites to both get Hilton Diamond challenges completed. It worked ok in that we are now both Hilton Diamond but checking in and out each day and keeping the same room was a faff as the system kept automatically allocating us a different room. Also, we continually had holds put on our credit card that took a while to clear. Probably about 15-20 mins a day at reception but we did get extras for our trouble lol. Nice lounge btw, with good showers… was funny when i spotted a women getting caught taking about 20 cans of soft drinks and putting them into the lounge. From what i overheard she had already been warned and then the drinks in her hand, were taken off her and she walked out. Nice friendly group of filipinos who manage the bar too.. I agree those bar staff should win an award, they treat you like a long lost cousin, create a great atmosphere that gets visitors chatting to each other. The fact the lounge was rather run down and badly designed gave it character. The reception always tried to convince me at check in I should use the other more “upmarket lounges” I had access to because of my flight status. Probably the only lounge Ive been happy to queue for. Which is better in Abu Dhabi if you have a lounge club card, Al Reem or plaza premium? I’m sure I was there in November! Looks remarkably similar. I was flying with BA so its whichever lounge I was directed to. I was very impressed though, I liked the individual seats which was quite enclosed so you have a nice amount of privacy. Not to mention the bar staff who filled up my champagne glass without prompting every time it dropped to less than half full…. Press release came out yesterday! OT – it looks as though on-card Avios at Pizza Express have gone. Seems to have ended on Jan 30th. Ok, thanks – didn’t think I could have beaten you to it! Still not made it in, and no T5 flights until Easter. Half term is Gatwick. Are the coffee machines working yet? I was there a couple of weeks ago – I wasn’t overly impressed with the food offering, but the self service nachos were nice, as were the individual cubicles. People have been asking about MR points for supplementary cards on Platinum. When applying for a Gold for my wife two weeks ago, I deliberately did not ask for a supplementary. Having done the spend and got the 22,000 points she upgraded to Platinum with just the basic card (received in two days). She then requested a supplementary receiving 5,000 MR for ‘1st Platinum Supp bonus’. I/she also requested a Gold supplementary but have not received any points for that. Once you receive the card your annual and monthly limits will be reset, and the above limits will apply. Unfortunately there is no longer an option to stay on higher limits as the prepaid programme will be phased out. However, rest assured that we are working with MasterCard to offer an additional enhanced limits group in the future. Any news on how much per single transaction? My limits have amended slightly since I got the personal debit card but to £5k daily, £15k monthly, £50k annual limits (previously £60k IIRC) and £500 ATM daily limit. How did you receive that communication? How do you find out your limits? – when I choose that option in the app it just says failed to fetch attachments. The stated limit (£2k per day) does not mean you can put through a £2k transaction as a new cardholder, in the same way Amex would almost certainly block a £20k charge to a credit card with a £20k limit. Weird, works fine for me (Android app) – just drop their support email a message, they’re very good at replying promptly. I messaged them to ask why my daily limit had dropped. I think their arrangement with MasterCard means that their top limits on the debit card are less than on the prepaid. Did you guys asking for the personal card in addition to the business card or as a replacement? Thanks. Any chance of Lidl following suit? I prefer their products to Aldi’s. Very probably, I would guess that they will be watching Aldi closely on this one. I would guess that this is a win for the 0.3% rule. I shall be very interested to see our new Lidl in the nearest town (currently being built). They opened a new one about 15 miles away about 18 months ago in a place well known locally for its deprivation; fitted out to a very high standard, so it looks almost like a small Booths, and regularly has interesting stuff from Italy, Germany, France and Spain, and the place is usually very busy. Same in Carlisle. There used to be a much tattier Lidl 12 miles away in a much larger town, but it was always deserted when I went there, and it closed a few years ago. It looked much more like a Lidl in Germany, where when they started up their vans had big signs on them saying “Lidl is cheap”, which I found interesting in itself as shops in Germany (and Austria + Switzerland) normally never use the word cheap – things are claimed to be ‘good value’ instead. Very happy about Aldi, increasingly this is where we shop, as it’s next to the station so ideal before driving home. I’m currently planning booking a trip in Summer where I plan to make use of the $75 hotel credit that’s part of the amex gold. If I was to make a booking using the amex gold, assuming it qualifies for the $75 hotel credit, but then subsequently cancel my amex gold card a couple of months later because I plan to upgrade it to the plat card and make use of the upgrade bonus, will I still have the $75 hotel credit? Depends a bit in hotel – some insist on payment with Gold/Plat Amex, some any Amex, some don’t care at all! I was thinking of making a booking to take advantage of this but found the “selected” hotel prices to be very high, so you may want to comparison shop before committing. Got worried when I received an email from MBNA entitled “Important message from MBNA”, thinking it was going to be end of existing cobrand cards – thankfully just them saying that they’re changing the email address that messages are going to be sent from!! 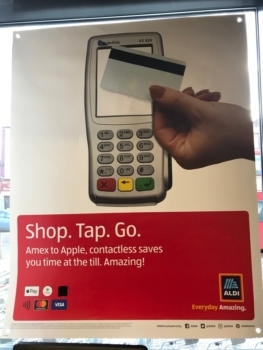 I can confirm Aldi now takes Amex as of 1 Feb 2018. I’ve just made a purchase……don’t see any huge points earning opportunities but every little helps. O/T I have an IHG accelerate target I was hoping to complete in one go. I had a stay, spend $39 on food, book a points package and pay with credit card. I should have met 4 targets in one stay. However, only the stay target has been ticked off. Should I contact IHG or is there a chance they will still complete? They can be slow to update. Wait a bit then context them. be very very careful when meeting any in-hotel food and beverage target for Accelerate. – VAT component of spend does not contribute to the total so that’s 1/6th less value you spent towards the target. – they also use the in-hotel exchange rate if your target is in a different currency. The only way I found to protect against that is to vastly underestimate the exchange rate (like, at least 20% worse than bank/MC rate). Ideally allow a bit more. The net effect on one of my targets to spend $39 was that I spent $40-42 or so and only just exceeded the required minimum spend. Actually correction to the above my hotel spend was in GBP so I spent £40-42 or so and recall that I did not exceed the $39 target by much. Yes, just found this out. I spent £42.60 at dinner but some of that was on bottles of pepsi from the fridge as I don’t like draft coke. Looks like the pepsi has been classed as vending purchases and not included in the food and beverage charges. I have a receipt from dinner that adds the drinks on to the receipt so might have to argue this one….. Same here when promotions are on but try to move between different hotels in the same chain if they’re close together. We only take carry on anyway and typically rooms in one hotel are all the same and with guaranteed late checkout you’re covered for the time between check out and check in at the next hotel. Anecdotally IMHO if you look like you’re staying for just the one night you’ve got more chance of getting an upgrade. Was queried in Curve beta group recently but they didn’t say it had. Was it in a location where you’d used it before? (some of them seem to have slightly unclear wording for the retailer name which can occasionally cause issues in rewards tracking). No-one told me it had ended …. although that does explain why I never got any notification of points on recent M&S trips. Definitely worked cumulatively for me on Plat and Gold (£200 off £600 on Plat). Have you had the confirmation email through that you’ve triggered it? If so, mine took about 10 days after that to show on statements. Was the £200 off £600 not for amex travel rather than Hilton? I got the £50 back for Hilton cumulative spend, despite being on a ridiculously cheap winter sale pre-paid rate, which they said wouldn’t count. I also got the £200 back for AMEX travel cumulative spend.